Power savings of 80% compared to filament bulbs. 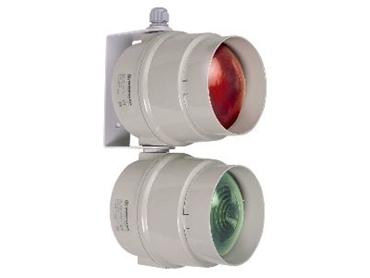 BALLUFF-Leuze has released the Werma LED traffic light 890. The maintenance-free LEDs have a life duration of up to 50,000 hours, equating to six years of continuous operation. The low current consumption of the LEDs means a power saving of over 80% compared to lights with filament bulbs. A clear signalling effect is achieved even in direct sunlight thanks to a transparent, colourless dome. The relevant beacon only gains its colour when the signal is activated. The unit can be mounted either directly onto the wall or by means of a fixing bow for one to two traffic lights. When using the fixing bow the traffic light can be set at the optimal angle. The housing has a protection rating of IP 65 and is suitable for outdoor use. The traffic light can be delivered fully assembled on request.